0.750" (19.05mm) dia x 0.500" (12.70mm) thick, SmCo30 Rare Earth Samarium Cobalt Disc Magnet, Magnetized through the thickness, Nickel plated. Rare Earth Samarium Cobalt Disc Magnets can operate in high temperature environments, or in an application where a demagnetizing force is present. Samarium Cobalt Magnets are typically used in high temperature motors, aerospace and military applications. These strong SmCo disc magnets can be manufactured with the direction of magnetization through the thickness or across the diameter. For larger SmCo disc magnets, multiple poles can be put on the face of the magnet, which will make the holding force greater between the disc magnet and the adjoining magnetic material. SM Magnetics, the engineering and manufacturing sister company of SuperMagnetMan, has been assisting Corporate customers for many years with their custom SmCo disc magnet applications. This includes material selection and optimization for applications such as medical magnets, sensor magnets, and aerospace assemblies. SM Magnetics works with Corporate customers to optimize their design and then manufacture the specific disc magnet or magnetic assembly to meet the required spec. SM Magnetics has their own ISO certified factories and controls the entire manufacturing process when making individual magnets or entire magnetic sub-assemblies. For assistance from a technical representative at SM Magnetics, click here for the contact info. Or, if you need assistance from SuperMagnetMan with your neodymium disc magnet, Contact us, or use our online custom magnet quote form. Check out our Samarium Cobalt Magnet Table to view the material specs for all SmCo Magnet Grades. 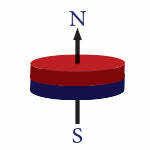 And remember to use care and caution when handling strong disc magnets, as outlined in our Magnet Safety section.